Valerie the "Roboceptionist" greets a visitor at Carnegie Mellon University's Newell-Simon Hall. 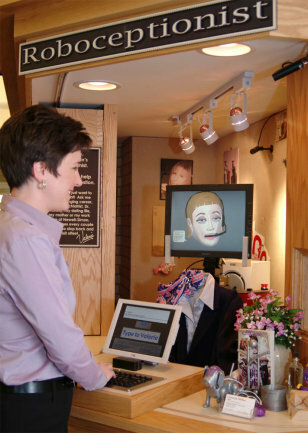 Valerie's face is displayed on a flat-screen monitor mounted atop an industrial robot. The computer scientists and drama students behind the project tried to give Valerie more personality than your run-of-the-mill robot.